Assured a playoff spot in the BVI Softball Association Juliette Penn Fast Pitch League where there are just three female teams, the winless West End Warriors who ended regular season play at 0-10, did the unthinkable by stunning the favored Hawks to whom they lost three times in the regular season. The regular season futility didn’t matter on Saturday as the Warriors called off on the Hawks with a 14-4 victory, their first of the season to even the best of five playoff series at 1-1, after losing the opener, 21-7. The winning pitcher was Sarah Potter and the loser was Riiah Durante. The Warriors’ Kimesha Adams doubled in four at bats, scored a run and had 4 RBI’s. Kayanna Parsons went 2-for-2 with two runs scored and two runs batted in. Sharia Romney had a 2-for-4 game with two runs scored and she drove in two. 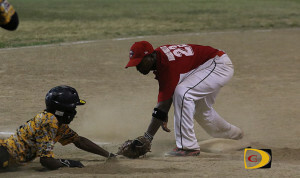 Jheane Niles and Sheniqua Fahie each had two hits for Hawks. In the men’s division, defending champions Pirates opened their series with the Reds and secured a 14-6 victory, before rains wiped outSunday night’s game where they led the Reds 5-4 in the third inning. Allen Smith who was on the mound when rains came on Sunday picked up Friday’s victory. Lionel Hodge suffered the loss. Pirates first baseman Rico Penn slammed three home runs in four trips to the plate and finished with 7 RBI’s. He also scored three times. Tramore Frazer was 2-for-4 with a double, a triple, two runs scored and two runs batted in. Devon Bedford finished 3-for-4 and scored twice. He also drove in two runs. The Reds’ Leon Martin had two hits in four at bats including a double and a home run. He scored twice and drove in a run. Edward Venzen went 2-for-2 with a double, a run scored and three runs batted in. Top seeded Power Outage whipped the Mobsters 15-1 in the opener, then needed eight innings to fend off the Mobsters 16-12, for a 2-0 series lead. Yervis Rodriguez got the victory for Power Outage while Andrew Stoutt took the loss. Power Outage hit attack was led by Jamarli James, who went 4-for-6. He doubled twice, tripled, scored three time and had a run batted in. Kyle Callwood homered in five at bats and finished with three runs scored and three runs batted in. Aquenio Gumbs lone hit was a double. He scored a run scored and had 3 RBI’s.